The International Fund is well positioned for 2019 with quality on offer in the UK and oil and gas back in favour, despite some loss makers this year. 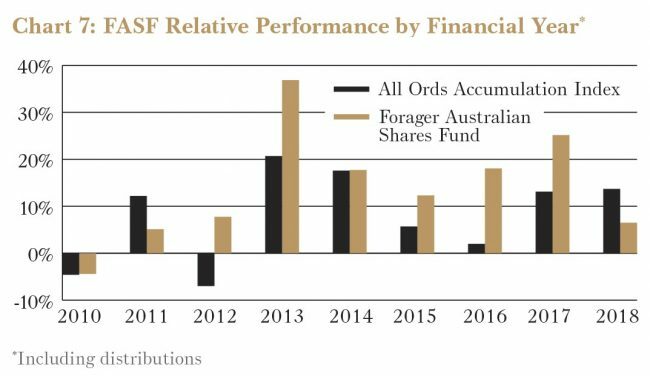 The Forager International Shares Fund returned 8.8% in the 2018 financial year, which was significantly less than the 15.4% return posted by the MSCI World Index*. Since inception the Fund returned 15.7% per year (assuming full reinvestment of all distributions), compared to 16.1% for the Index. Last year’s performance report contained a warning for investors not to expect a repeat of what was undoubtedly a good year. While we delivered on that, it wasn’t a horrible result given the 27% return in the 2016/17 financial year and the 30% cash weighting with which we started the current period. It was also a year that was much kinder to growth and momentum investors than it was to Forager and its value investing brethren. With a few exceptions, this has been a consistent and unusual theme over the past five years. 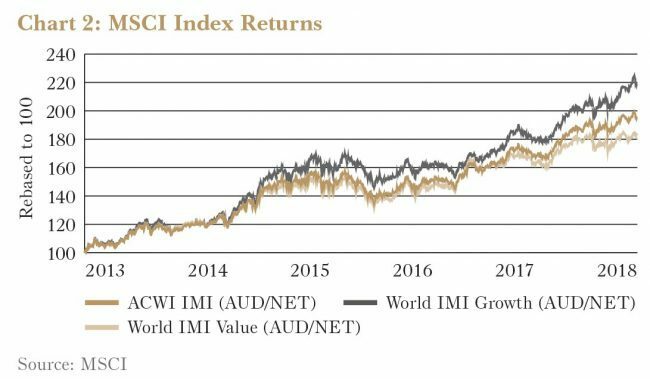 MSCI provides growth and value versions of its global indexes. It defines value as those stocks trading on low earnings multiples and low price to book ratios, and growth as companies exhibiting high earnings growth and correspondingly high valuation multiples. Over long periods of time, value has consistently outperformed growth. As you can see in the chart below, growth has been on top for the past five years and dramatically so in the past 12 months. A partial explanation is that the global economy is undergoing significant structural change. Growing businesses like Google owner Alphabet (Nasdaq:GOOG), Netflix (Nasdaq:NFLX), Facebook (Nasdaq:FB) and Amazon.com (Nasdaq:AMZN) are destroying traditional value businesses in the media and advertising industries. The good news is that disdain for traditional value stocks is creating opportunities to deploy funds into sound businesses offering attractive rates of return on our capital. Entire markets, viewed as “old economy”, are trading at huge discounts to the tech heavy US-markets. 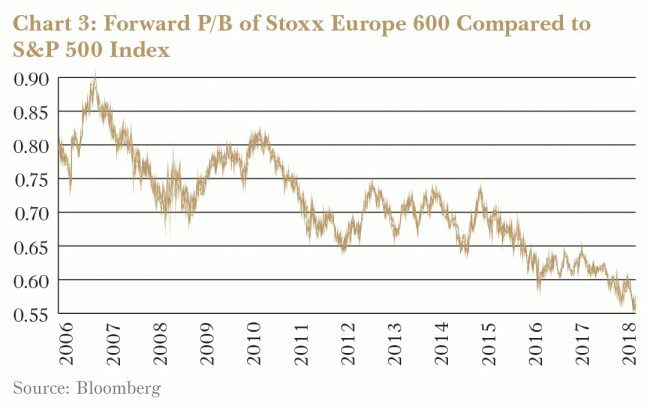 As you can see in chart 3, the price to book ratio of the Euro 600 is at record lows relative to the US’s S&P 500 Index. Our cash weighting has dropped significantly and we are as optimistic about the portfolio’s potential returns as we have been since early 2016. Another thing we promised last year was that we would “rarely, if ever, have a year as devoid of loss-making investments as 2016/17.” That promise was also duly delivered on. Sarine Technologies (SGX:U77), an Israeli manufacturer of diamond processing equipment, was the smaller of two meaningful losers for the year. This Singapore-listed company remains the dominant supplier of equipment and technology to India’s giant diamond processing industry and, in hindsight, we managed to pick the bottom of the cycle reasonably well. Volumes of diamonds processed have returned to normal. Unfortunately, Sarine’s profit hasn’t returned to anything like its historical highs. While counterfeit technology and outright theft have been copping the blame from management, the real problem is internal. We overestimated the value of Sarine’s ongoing annuity stream relative to the profits from the upfront sale of equipment. Now that most industry players are using one of Sarine’s machines, annual profits from equipment sales plummeted. While recognising this early, we were unable to exit the investment quickly enough. The share price fell 26.0% between 30 June last year and our average sale price and lopped 0.6% off the Fund’s return for the year. That pales in comparison to the impact Technicolor (ENXTPA:TCH) had on our returns, however, with the share price falling 64.0% between our purchase in late 2017 and the end of the financial year. It has cost 4.1% of the Fund’s assets and single-handedly accounts for a large chunk of the difference between our return and the index. You can read the full mea culpa in the March Quarterly Report. Technicolor’s profitability has been crimped by increases in the prices of memory chips and poor cost management. We also overestimated the value of some of the company’s divisions. Compounded by a significant debt burden, the impact on equity value has been dramatic. Our view is that it is overdone, something we should know the answer to by next year’s performance report. Finally on the negative side of the ledger, the Fund owns two Italian stocks that have been caught up in the political turmoil engulfing that country. The net contribution from the two was positive over the year, but meaningful gains in the first half were offset by a retraction in the second. We think both businesses are sound long-term investments — cement company Cementir (BIT:CEM) doesn’t even have any business in Italy — but the Italian discount is unlikely to disappear any time soon. Moving on to the positives, after several years of detracting from performance, it was stocks related to the oil and gas sector that saved us this past financial year. As a group they added 4.4% to the year’s return and were individually some of the most significant contributors. US giant Halliburton (NYSE:HAL) has been a key investment in the portfolio since 2015. While its profitability rebounded sharply over the year thanks to a resurgent US shale sector, its stock price was never as cheap as other players in the market. The share price rose 21.8% between 30 June last year and our sale in March of this year and contributed 0.8% to returns. Gulf Marine Services (LSE:GMS) has also been in the portfolio a while and was one of a few oil services stocks that experienced share price declines despite a rapidly rising oil price. The Fund benefited, however, from some opportune purchases at the share price nadir and the stock ended up contributing positively to overall returns. It is also one of the most prospective opportunities in the current portfolio. 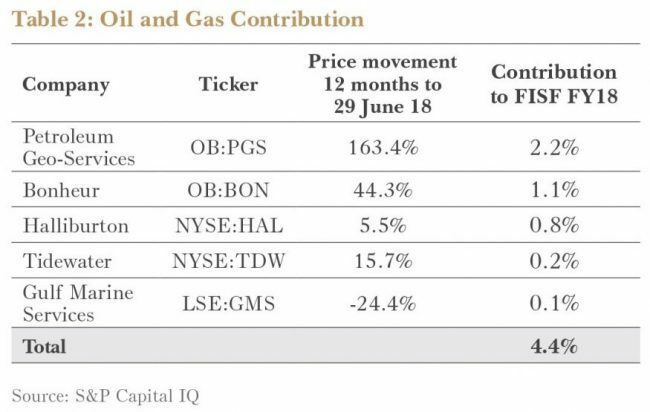 A stock that was removed from the portfolio in June last year, Norwegian seismic company Petroleum Geo-Services (OB:PGS), was the best performing stock in the Fund. Only re-purchased in early January, the stock jumped 93.0% over the ensuing six months and added 2.2% to portfolio performance for the year. The team left a meeting with PGS at an oil and gas conference in September 2017 unsure whether PGS would see the year out. A trading update in early January showed dramatic improvement, though, and we quickly re-established a position. Fortunately, as it turns out. The company is progressing nicely and the whole seismic sector (exposed to oil and gas exploration) is improving rapidly. Tidewater (NYSE:TDW) is a new addition to the portfolio. Tidewater is a competitor to ASX-listed MMA Offshore (ASX:MRM) and, even more so than MRM, also has a reconstructed balance sheet. The market for offshore service vessels is going to take a lot longer to recover than the seismic market, but both these stocks should be around to see the ultimate recovery. Tidewater’s share price is up 7.3% since purchase. Finally, we will throw Bonheur (OB:BON) into the oil and gas sector even though its value is mostly outside the sector. A perception that it was exposed to oil and gas could be one reason why it was cheap, but Bonheur’s main assets are UK wind farms — far more reliable than the oil sector. The share price is up 34.4% since initial purchase and, as explained in the June Quarterly Report, we’re confident there is more to come. Most of the new stocks added to the portfolio in the past 12 months are listed in the UK. They will set the fund up well for the future, but some have already added to performance. Auto Trader (LSE:AUTO) and Babcock International (LSE:BAB) are two of the better quality businesses in the portfolio. The latter is good, the former outstanding. But that difference is also reflected in their asking prices — less than ten times earnings for Babcock versus 20 times for Autotrader. Both have jumped more than 10% since our initial purchase but we plan on holding them for a long time. Just Group (LSE:JUST), too, is shaping up as a stock we will own for a long time. Operational progress has been outstanding but the share price has hardly budged and our total return for the year was just 0.8%. As long as the company continues to increase its return on equity and grow the business, we should be happy owning it, but there is always a risk we have missed something. We will be watching closely to ensure our positive impressions are justified. The final UK contributor was a small company called Blancco Technologies (AIM:BLTG). Our disclosure of this investment has been kept to a minimum due to its small size and lack of liquidity. Once we are done buying, we will tell all, but suffice to say it is one of the most exciting opportunities in the portfolio. The share price is up 19.0% since initial purchase and Blancco added 1.0% to the Fund’s return. Last year’s best performer, Lotto24 (DB:LO24), showed that we, too, can benefit from momentum. The business has been doing what we expected of it, but not much more. The share price rose another 50.9% during the financial year and now trades north of €14. 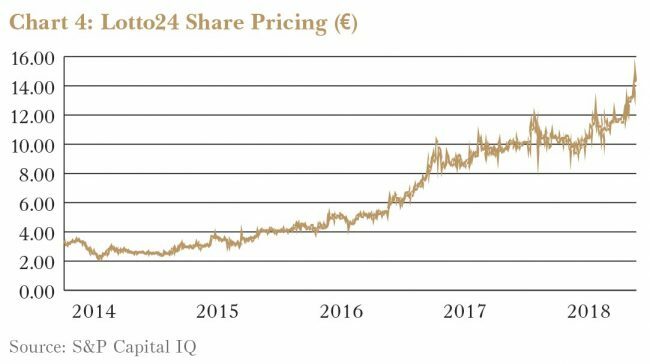 We were buying the stock in 2014 at less than €3.50. It has been a wonderful contributor to the fund but is now trading in line with our valuation. If it rises much further, it won’t be in the portfolio this time next year. Last but not least, the impact of exchange rate movements was positive. 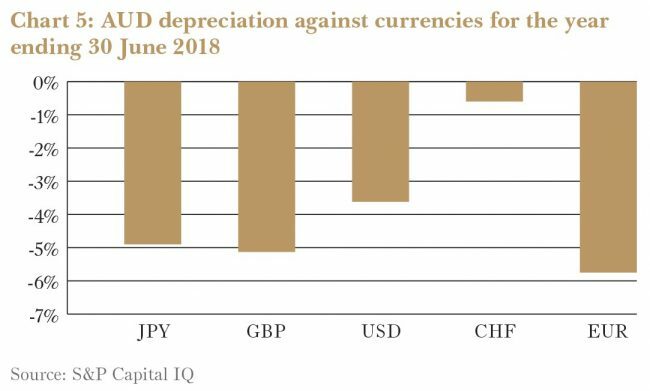 The Australian dollar depreciated against most major currencies and that increased the return for the year by more than 3%. All of that added up to a net 8.8% return for the year. 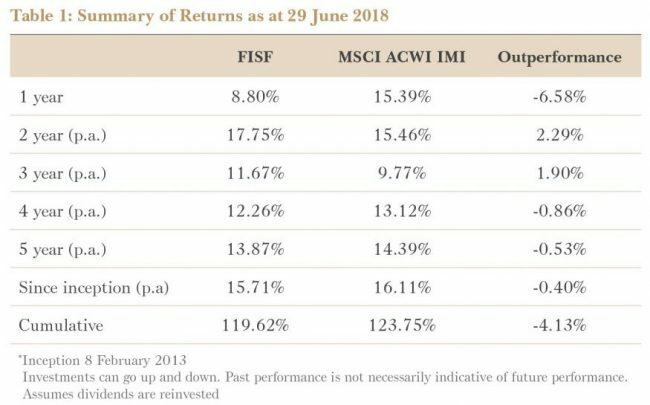 Due to the lack of big winners, the realised component of the return was relatively small and the fund’s distribution is estimated at 6.5 cents. We don’t let tax decisions drive investment decisions but we do try and avoid unnecessary tax bills when possible. As of 29 June the portfolio cash weighting was 13.1%, down significantly from a year ago. That doesn’t guarantee returns — we would still welcome more widespread pessimism — but the portfolio is generally more prospective than it was at the same time last year. This year was characterised by profitable exits, new contributors and some ideas that didn't work out. Mining and oil services continued to deliver. The Australian Shares Fund delivered a return of 6.5% for the year ended June 2018, underperforming the benchmark^ by 7.2%. Over the last five years, an investor’s capital has compounded at a rate of 15.8% p.a. against 10.3% p.a. for the benchmark. Early investors that reinvested their dividends would have grown $100,000 from inception in 2009 to $308,389 at 30 June 2018 (ignoring taxes). It wasn’t the losers that caused underperformance this year. The portfolio suffered from a lack of big winners. The top three winners from last year brought in close to 17% in performance. This year’s winners didn’t win so much, contributing only 9.2%. As mentioned earlier, this was a tough year for value investors globally. Australia proved to be no exception. Standard & Poor’s Australian Growth Index rose 15.3% in the last financial year. The comparable value index managed only 1.7%. Many of the biggest winners in Australian small stocks were popular growth names like A2 Milk (A2M). This is not an area where we spend much time prospecting for new ideas. Cash was another drag. With equity prices rising, 25% of the Fund was sitting in cash on average throughout the year. Another 2% return could have been achieved by putting that cash to work, but it is not that simple. During the year, 46% of the portfolio was sold and only 36% reinvested into new or existing opportunities. In a year of relatively high turnover and buoyant markets, we couldn’t find a home for the extra cash. There is more selling of successful investments to come, but we continue to work to identify attractive opportunities to shrink the cash pile. And we only need a handful of new investments. The Fund’s stock watchlist is full of opportunity, awaiting lower prices. As some recent downgrades have shown, it doesn’t necessarily take a market correction to set up a fat pitch. With the Fund holding about 23% cash after a big distribution, a few attractive opportunities would have us under 15%. Towards the end of the financial year, the Fund sold the last of its investments in Jumbo Interactive (JIN) and Service Stream (SSM). We’ve told the story of Service Stream, the firm’s most successful investment ever, before. In last year’s annual performance report we mentioned that the company probably has a few years of growth ahead of it. With the looming completion of the NBN network, Service Stream will need to transition towards earning maintenance revenues. However, with margins at fairly high levels, we think these prospects are well reflected in the current price. Jumbo has had a stellar run over the past year. Revenue increased more than 22% and the shares rose 95% including dividends. Jumbo’s current level of profitability is in line with our expectations and the business is likely to keep growing. But the gap between price and value has now dwindled. As with any year, there are stocks for which the investment thesis didn’t work out. For most we reassessed and moved on early. Reckon (RKN) was the biggest of these. It started the year as an investment worth 8.1% of the portfolio. By late July its weighting was zero. Reckon’s accounting software is losing out to bigger competitors in the small business space and the company went through a convoluted transaction to list a small unit in London. On reviewing our valuation for Reckon’s software for large accounting practices, we found that it was unlikely to be worth as much as firstthought. Despite that, a bid by MYOB (MYO) valued that unit at what seemed like a sky-high sum. With concerns about approvals from competition authorities on both sides of the Tasman though, MYOB walked away from the deal in May. It now leaves Reckon in trouble and with a share price 38% below the start of the year. Smart Parking (SPZ) was another where we rethought our thesis and moved on. And that was before the stock doubled, then halved. Over the next few years the company will have to make good on its promises and deliver strong growth. Another in this bucket was RXP (RXP). Having accumulated a small holding in what seemed like an attractively priced capital raising, a management update left us doubting our estimates of sustainable profitability. We sold and moved on. Together these two stocks cost the Fund 0.9%. The thesis has also been questioned for Thorn Group (TGA), where we continue to add to our investment. Thorn was true to its name this year, costing the Fund 2.6%. 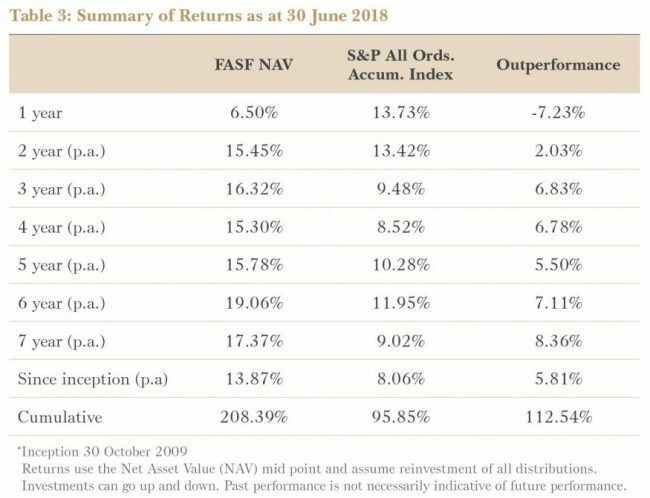 It was the greatest detractor from performance in the portfolio and we discuss this company in more detail in the June Quarterly Report. A litany of issues faced the business but its core unit, Radio Rentals, has a place in the world. With net tangible assets double the current market capitalisation and plenty of upside if things go well, we remain holders. 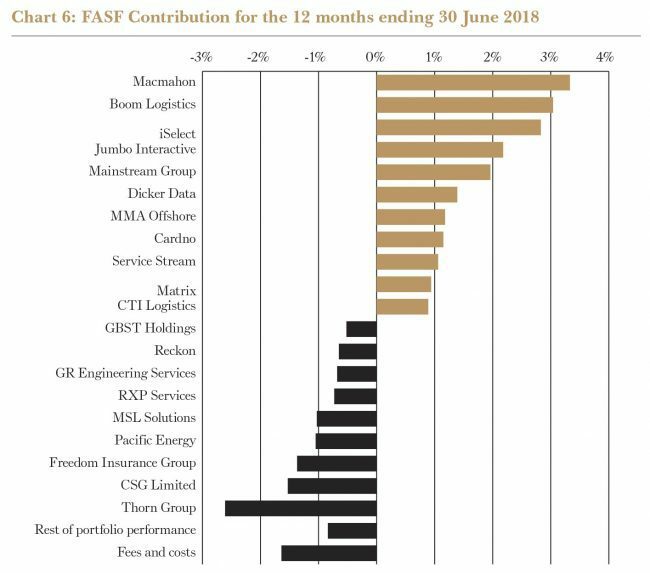 The Fund’s investments in mining and oil and gas services businesses contributed 12.5% to last year’s performance. At 8%, this year’s contribution was more reserved, but nothing to sneeze at. 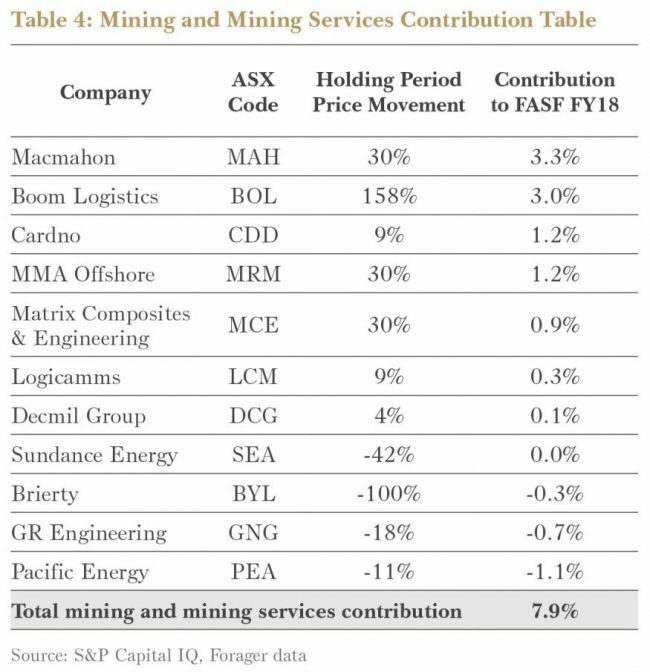 Top of the list once again was mining contractor Macmahon (MAH) with a 30% share price appreciation and 3.3% contribution. This performance came at the beginning of the year, when the tussle with CIMIC (CIM) came to an end and the company finalised its contract to work on the giant Indonesian Batu Hijau gold and copper mining project. Since then things have been progressing well and the stock price has trended sideways. Batu Hijau’s more profitable second stage commenced in April and the historically problematic Telfer contract is likely to break even for the year. New projects at Byerwen and Mt Morgans have ramped up and Macmahon’s consistent work at Tropicana was extended. Some more recognition of just how far the company has come is warranted in the new financial year. It remains the Fund’s largest holding. Another of the mining-exposed stocks to make the list was crane owner Boom Logistics (BOL). It’s been a long wait (the Fund first started buying Boom in 2014) but this year some tentativepositives started to emerge. Resources companies have been able to delay necessary maintenance, but the days of delay are coming to an end. And Australia’s wind farm installation boom has created a need for large cranes to lift these 100 tonne behemoths more than 100 metres into the air. The stock rose more than 150% during the year and contributed about 3% to performance. The rest of the mining services investments produced mixed results. Cardno (CDD) contributed 1.2% as the controlling private equity shareholder continued with the cleanup of the business. The Fund sold its shares in both GR Engineering (GNG) and Pacific Energy (PEA) early in the year after assessing our expectations in light of a contract disappointment and a reassessment of the valuation potential, respectively. The latter two cost the Fund 1.7%. 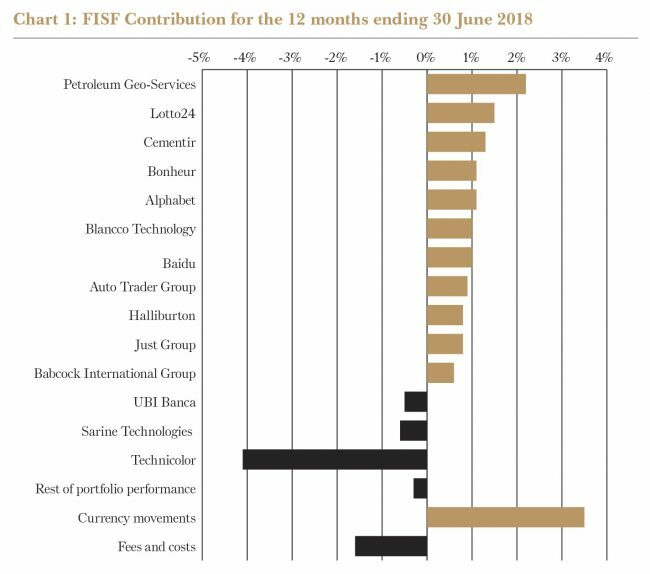 There was also more action this year around the Fund’s oil and gas services positions. Matrix Engineering (MCE) continues to have a place in the portfolio. The company was quiet during the year, while working to manufacture a broader range of products. Its traditional oil and gas product is now joined by products for resources, infrastructure and defence customers. This transition to new products has been going on for a while and is yet to meaningfully impact on revenue. It is unlikely to do so. But with a world class manufacturing facility and an increasingly attractive competitive position, Matrix should be able to earn good returns once the oil industry turns. The business remains an option on the recovery of offshore oil and gas drilling activity. Another newish addition in the sector is MMA Offshore (MRM). This is one the Fund has owned before. After exiting in late 2016, fearful of leverage and a tough environment, we bought the stock again in late 2017 as the business reduced its debt load by raising equity. This is a classic Forager investment: an asset heavy business in a difficult environment with an uncertain future. It will require some patience, but a surge in the oil price has made the offshore oil and gas activity recovery more likely since the initial purchase. The share price is up about 30% since our investment in November. A number of our investments are maturing. We monitor these closely for any changes which could result in an inability to meet our minimum return hurdle. This could be for a range of reasons — capital gains, new competitive threats or new information. For now, we continue to be holders of Mainstream (MAI), Dicker Data (DDR) and CTI Logistics (CLX). Fund administrator Mainstream contributed 2% to the portfolio this year, with its share price rising nearly 70% on the back of continuing fund growth and growing margins. When we invested, we liked the company for its combination of strong growth prospects, scalable cost base and sticky customers. Mainstream continues to actively build scale and acquired Trinity and IRESS Superannuation this financial year. In a bullish market, we expect this business will continue to perform well. Declining stock markets, fund closures or the loss of a key client, especially Magellan Financial (MFG), would hamper it. Overall, the business continues to track well against our expectations and in June Mainstream affirmed its current year guidance and provided a positive outlook for next year. Another business that added meaningfully to performance was Dicker Data (DDR). The share price appreciated 22% and it paid dividends equating to 7% during the year. Revenue and net profit before tax were slightly ahead of guidance for the year to December. While the business lost an important Cisco contract in New Zealand, the company was quick to appoint replacement vendors. Dicker Data continues to grow organically and pay close to all of its earnings out as fully franked dividends. We also take some comfort in knowing that management, who own the majority of the company, are in it with shareholders. CTI Logistics (CLX) also performed well, appreciating 25% over the year. The original investment case was based on its downside protection from the net tangible asset backing, a dominant market position in Western Australia, a strong management team and exposure to an economic recovery. CTI has made the most of its weakening competition by making a string of acquisitions. Jayde Transport was purchased in October and the acquisition of Stirling Freight Express was announced in May. Both transactions are expected to generate cost savings from consolidating leases and building up denser freight networks. Sometimes there just isn’t enough stock for sale to allow the Fund to buy into promising companies. This was the case with contractor Decmil (DCG). After a downgrade of earnings expectations last July the stock looked attractive. But, not much volume changed hands at the prices we were prepared to pay and we were stuck owning a tiny 0.2% position. Despite the price rising 56% during our holding period, the stock was sold for only a small dollar gain. We experienced a similar issue with 3P Learning (3PL). The Fund was able to invest prior to the price shooting up but the current portfolio weighting is just 1.4%. The weighting would have been much higher if not for a lack of available stock. Sundance Energy Australia (SEA) also appeared attractive back in January, however with a quickly rising price we were unable to buy a meaningful stake. This might have been fortunate. Sundance announced an acquisition and capital raise in March which hinted at management wanting to get bigger rather than sweating existing assets. We sold out of our small stake in the same month. A stock where we finally got a more meaningful position was CSG (CSV), a provider of printing and tech solutions to small businesses. A flood of selling after a major downgrade in February allowed us to increase our investment. Since then it has been a wild ride as early optimism gave way to another earnings disappointment. The business needs a lot more care and a new executive chairman should help with the turnaround. CSG cost the Fund 1.5% for the year. While not as many as we would have liked, the Fund did add a few large new positions in the past year. Three have made it into the top five holdings at year-end: iSelect (ISU), Freedom Insurance (FIG) and MMA Offshore, already discussed above. iSelect, the comparison website, is the largest of the group, and at year end was 8.4% of the Fund. Despite buying the stock in late April it contributed 2.8% to the year’s performance. We were prepared to wait for value to be realised, but corporate interest from the biggest competitor brought some heat to the share price. For more on this one please see the June Quarterly Report. Freedom Insurance’s share price went the other way, costing the Fund 1.4%. This insurance distributor is a young and growing business, underpinned by assets and launching new products. A large and attractively priced acquisition in April should give the business more flexibility to grow. For both of these stocks it is too early to make a call on whether our investment thesis was correct. Both are working their way through problems, but we expect to be rewarded for holding them over time. The distribution for the past year will be about 21.29 cents per unit, which sounds high when compared to returns of 6.5% for the year. The difference lies in the Fund selling stocks that have positively contributed to performance over a few years. These sales cause the Fund to actually distribute those realised gains to our unitholders. Investors shouldn’t expect distributions of this magnitude every year. The Fund invests in stocks mostly for capital gains. Returns and distributions are likely to be lumpy.